New theme for the Stem Challenge with Babipur – this time as it’s the holidays for some of us and the rest of us are winding down towards them I’m going to let this run for 2 weeks! Coding is a language the children of our generation are going to need to understand. It is a logical approach to thinking that is beneficial for all ages. Problem solving is a life skill. There are simple ways to teach coding and it is great to be able to do it from an early age. I’m going to start this new Babipur Stem challenge with a Coding Maze Puzzle. Basically we have to direct the Nin out of the maze. The Nin can only move in 4 directions; up, down, left and right. We have these directions represented with 4 different items; I’ve used the Grapat Mandala pieces as pictured. Down – down – right – down – right – right – up – up – up and one more up to escape the maze. We’ve used the mandala pieces like a line of computer code to help the Nin escape. 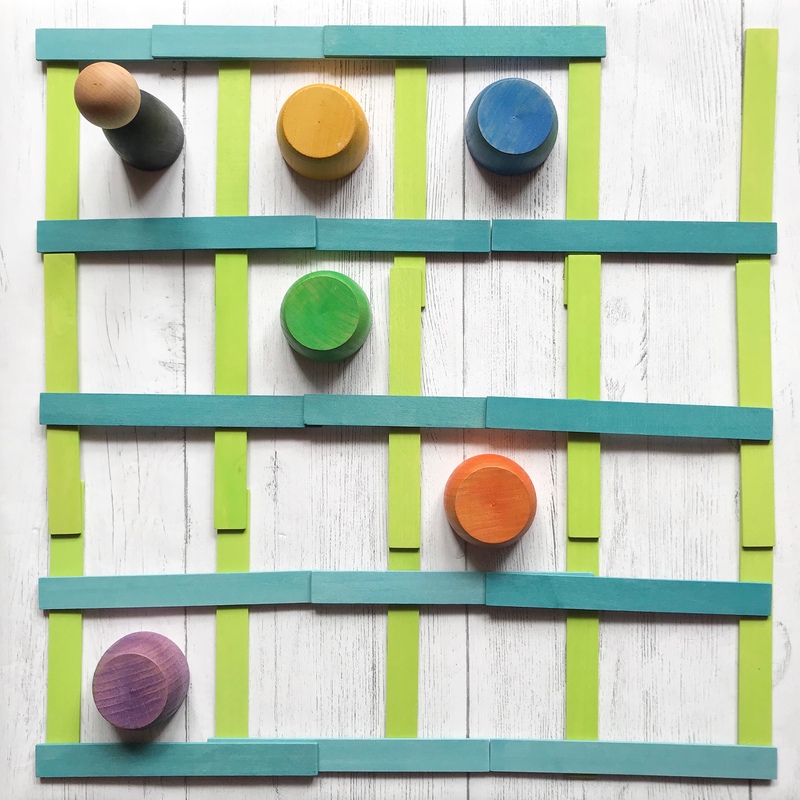 This style of problem solving challenge is great to do with multiple siblings or friends, as one can work out the code then the other can follow it and see if it works. You can also make the maze harder when they get the hang of it! I have 3 boys aged 2, 6 and 8 and you can tailor this activity for all 3 of them. It’s brilliant. You can use anything not just Nins and blocks. You can use playing cards, post-it notes, Lego, masking tape, string, figures, coins… whatever, anything goes! Please join in and post a picture embracing the theme of coding in the Facebook Babipur Hangout group or on Instagram with the tag #babipurstem so I can find it! Please tag Babipur on Instagram too. This time the winner can choose a set of Grapat Mandala pieces as their prize! Please feel free to join in with this fortnight’s theme of coding/logic – great for older kids too!